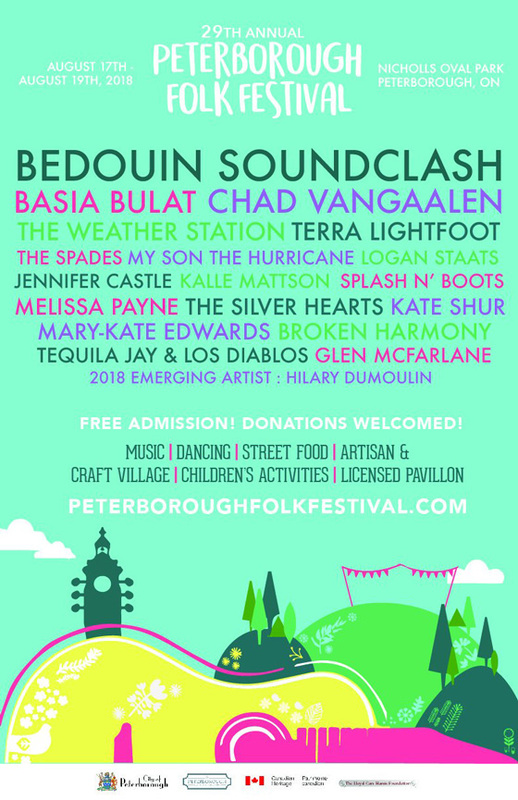 The long-running Peterborough Folk Festival is gearing up for another year of music-making, and organizers have now released the lineup for the fest's 2018 edition. Taking place at Nicholls Oval Park from August 17 to 19, the 2018 lineup is led by Bedouin Soundclash, Basia Bulat and Chad VanGaalen. Following closely behind are the Weather Station, Terra Lightfoot, the Spades, My Son the Hurricane, Logan Staats, Jennifer Castle, Kalle Mattson, Splash 'N Boots, Melissa Payne, the Silver Hearts, Kate Suhr, Mary-Kate Edwards, Broken Harmony, Tequila Jay & Los Diablos and more. More artists are set to be announced, but you can take a look at the the current festival schedule here. Festival admission is free of charge, with donations welcome. The event will also feature street food, an artisan and craft market, children's activities and a licensed pavilion. Further information can be found through Peterborough Folk Festival's official website.